Disclaimer: Mike bought his HP-A8 from Jaben Indonesia. Edd received a loaner from SCV London. This is a double review. Standard text is Edd’s. Italics are Mike’s. At the heart of the A8 is a 32bit Asahi Kasei AK4399 D/A converter. An Asynchronous, Class 2.0 USB supports the transfer of audio up to 24bit /192khz, as do the other digital inputs. There is also support for DSD files (DSF only, not DFF). This is a downloadable SACD audio format, which (at the moment) is only supported via the SD card reader on the back of the machine. 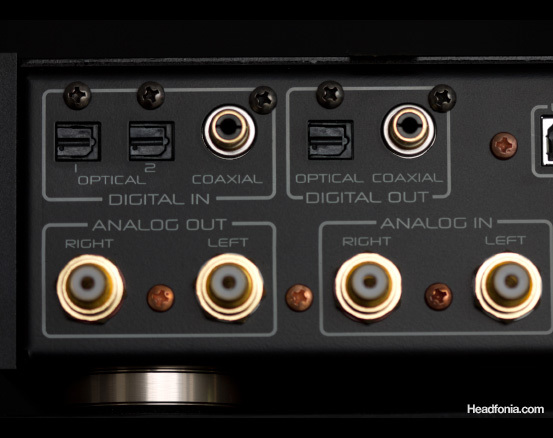 For non-computer related digital audio the HP-A8C has two optical, one coaxial and one AES/EBU input, along with one optical and one coaxial digital output in case you feel the need to convert USB to another external DAC. With the added ability to up-sample any of it’s digital signals (x2 or x4) this is a feature rich high-end machine. The fully solid-state, completely discrete headphone amplifier is capable of driving pretty much any headphone you can think of. For those with any analogue devices left, or if you’re lucky enough to own a better DAC, there is a pair of analogue inputs to use the headphone amplifier independently. Gain is selectable from 0 to +20dB (0.5dB steps) if you can find something that struggles with the default levels, which I couldn’t. Even headphones as demanding as the Hifiman HE-6 should feel right at home here, which is an impressive boast indeed. The Fostex HP-A8 does digital to analog decoding on an entirely different level than anything I’ve heard before. Based on AKM’s AK4399 D/A chip, this device is capable not only of projecting an uncanny sense of space and soundstage, but far more than that, the sound of a particular recording I’m playing through it. As I’m switching from one CD to the next, a constant sense of awesomeness struck me over and over again. It’s like being there during the recording session, plugging your headphones directly in the producer’s mixing table. We’re talking a far more intricate level of detail retrieval, yet revealed in such an effortless manner by the A8. This is nothing like I’ve ever heard before. It’s not as grand sounding as the Ref7.1 DAC from Audio-Gd, but the Fostex does things I don’t even hear on the Ref7.1. Even now I’m still awestruck when I play different CDs through the A8. Not only do I get to witness different musical styles and genres, but I actually get a more complete picture of the recording than I was previously able to hear. Even after witnessing the garbage-in, garbage-out principle on other DACs, I’m truly blown away by the amount of information that good old 16/44.1 CD contains. If they were able to implement this level of sophistication on mainstream priced CD players, surely, people would not bash CDs for being digital sounding and inferior to LPs. The Fostex HP-A8 is living proof that the so called “digital” CD sound is the fault of sub-par Digital-to-Analog conversion, a complicated process that turntables don’t have to hassle with. What I’m hearing is not only the subtle little sounds in the recordings, any half-decent DAC these days does that, but more than that; the color in the recording! From analog recordings taken in the 60s with their thick and grainy sound to the super-clean audiophile digital recordings. Not only does the technology behind a recording, but the particular set up of a recording and the steps taken in the mixing and mastering, somehow contribute to a particular “look” of a recording. All revealed by the Fostex in such an effortless manner. Audio gear with high transparency tends to be of the dry and clinical type. I can’t say that about the Fostex. It’s a very smooth sounding DAC for sure and clearly the smoothest sounding DAC I’ve listened to. If you like the smooth sound of the HP-P1 i-Device DAC/Amp or the HP-A3 USB DAC/Amp, the HP-A8’s sound somehow reminds you of the two but with technicalities that are not even close to be compared. Now remember how I said that transparent DACs tend to be dry and clinical? The Fostex is definitely not dry! I wouldn’t be able to enjoy any dry sounding DAC with Sennheiser’s merciless HD800 so definitely there is some coloration here: a smooth Fostex sound with a warm and musical tonality. But what keeps me puzzled is somehow, perhaps a function of über-level resolution, the smooth Fostex sound is able to keep itself from clouding the recording. It doesn’t polish the recordings like some DACs with a tube output stage tend to do. It’s smooth yet brutally honest: one recording to the next, I’m getting a clear picture of the entire look of that recording. Besides the A8, I got some ear time with the rest of Fostex’s headphone amplifier range as well and I must say that I’m most impressed by how consistent their presentations are. The main differences between them are their connections and the technicalities of their sound. The tonality is well balanced throughout, all display a clean and neutral sound that doesn’t jar your senses or feel artificial. This seemed to make them friendlier to a larger number of headphones than amplifiers with a more characteristic coloration. This is transparency as it should be, very detailed but smooth and not cold. The A8 has these features and takes smoothness, subtleties and soundstage to another planet. Good amplification often brings with it a nice blend of two quality traits, often considered mutually exclusive in lesser equipment. That magic is infused in the A8’s sound as a healthy dose of speed, without the typical tendency of over-brightness in the upper ranges. It’s smooth and articulate treble does wonders to crisp detail and listening for long periods never fatigues. The low frequencies get enough attention too. Bass is tight and well defined without losing weight or impact. The mid-range is perhaps even more impressive, feeding off the high’s lush smoothness and the low’s refined texturing to build a deeply involving experience. I felt an emphasis in the mids, but certainly not overdone and I loved it’s sublime clarity of presentation. A smooth balance of power, that is both delicate and authoritative, seems to be the hardest thing to do with digital sources and this is where the A8 delivers it’s magic. Although it will take up to 24bit/192khz (through all of it’s digital inputs) it excels with good, old CD quality. Let’s face it: this is the format that most people’s music will be in. After the silky smoothness, the next thing that struck me about the A8’s sound was the soundstage. It impresses hugely! Not only is the throw of instruments both far and wide, it’s also endowed with a sense of natural precision, an effect amplified by superb instrument separation. This rounds off a three-dimensional feeling that brought a lot of music to life in a big way. This effect is emphasized with headphones that already share this trait, so it really warrants a good set of headphones to get as much out of this as possible. Although compressed music is handled well, the only problem is that uncompressed is just so much better. It seems like any extra detail that you can throw at the A8 further aids a more smooth and delicate presentation. In fact, never before have I noticed so much of a difference between compressed and uncompressed formats, and I see this as a true testament to the refinement and transparency on display here. 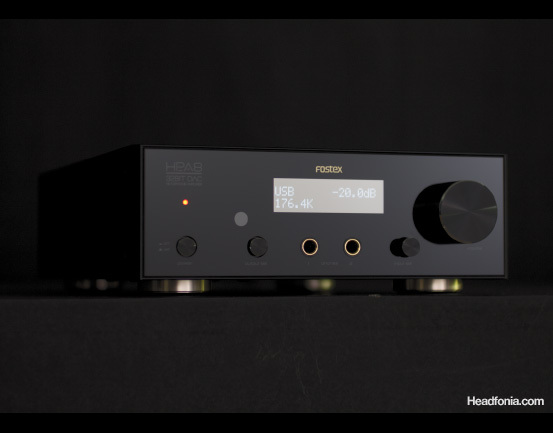 At one point I was comparing the Fostex to the Eximus DP-1, another highly regarded high end DAC/Amp box. Slightly warm but overall still a fairly neutral DAC, the Eximus didn’t have that flexibility in the sound that the Fostex has in terms of revealing the whole look of the recording. What I mean is, moving from one album to the next, I hear less of the album’s color on the Eximus than what the Fostex reveals. The Eximus, to me, is more in line with my experience with DACs. At roughly the $3K price tag, it’s very spacious sounding and with a good warm tone, and overall the performance is good. It’s just that the Fostex accomplishes much more than that. Before this I often raved about the KingRex’s UD384 DAC. The moment I heard the Fostex, I knew that the Fostex is on an entirely different level. Yet I went ahead and compared the two anyway, only to find that the difference is even bigger than I first thought it would be. The SoundMAGIC HP100 headphones are best for me with a little extra punch in the lower frequencies, though they are already impressive in this regard. A fantastic headphone and a great value! The A8 doesn’t provide that bass body but what it does to the rest of the frequencies and soundstage is nothing short of stellar. This was the least impressive headphone combination that I had, but only because of my preference of tonality shift, or lack thereof, and that’s a petty criticism. The highs, which can be a little overbearing on lesser amplification, sound nicely controlled here. Although the Beyerdynamic DT880 600 Ohm has less warmth than the SoundMAGIC, they manage to be great despite it and the A8 propelled them to a place of abundant detail and powerful presence. The bass here actually seemed to get a healthy boost in weight once you give yourself a little time to sink into it’s presentation. Soundstage is one of the DT880’s greatest abilities and that was brought even further out by the A8’s amplification. If you’ve read my previous review you will know that I have some problems with the V-Moda M-100, namely it’s overzealous bass and lack of midrange, but the A8 made the M-100s sound almost acceptable for their price… even for me! If you like them already I can’t help but think that you would love them on this amp, but as I said in their own review: at ten times the price the A8 is no solution. With electronic music I didn’t even need any EQ for the M-100 while connected to the A8. This really is saying something because I found them very lack-lustre and harsh on most other amps, even the Audiolab M-DAC. I will iterate it here because I seem overly harsh on the M-100. It really isn’t a terrible headphone! It’s possibly the greatest full-size fashion headphone ever made. It’s just not an audiophile/ jack-of-all-trades/ HiFi headphone. I noticed a statement on the Fostex marketing material for the A8 that recommends pairing it “with the Fostex TH900 headphones for excellent results”. I can confirm that, despite sounding like marketing fluff, this is a true statement indeed! Although I need to illustrate the A8’s abilities as an independent device, let me assure you right now that this is no one-trick-pony. 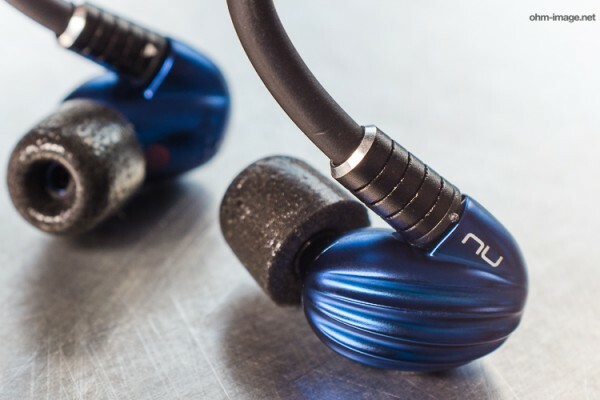 The A8 is a very capable machine at driving many headphones to truly amazing levels of quality. I was simply blown away by the TH900 in general… but with the A8? Wow! I can hear with every fibre of my being that these two were tuned to be connected to each other. The amplification of the A8 makes a lot of sense anyway but with the TH900 it’s synergy is just perfect. The strong bass of the TH900 gets suitably controlled by the A8’s fast and tight low-end amplification. Similarly the mids and upper ranges are full of detail and can be a bit punchy normally but the A8 keeps them in check. Although I will be doing a full review of the Fostex TH900 headphones next, I couldn’t finish this section without at least brushing on the topic of the TH900 vs the Denon AH-D7000, while connected to the A8. For those who don’t already know, the D7000 is almost identical to the TH900 in shape. The TH900 is coated in a gorgeous red lacquer but it has wood underneath, just like the D7000 (albeit a different type of wood). Both models are made by Foster Electronics (of Japan) and thus share a lot in common inside and out. The D7000 has recently been replaced by a very different model and is no longer available to buy, but fortunately I happen to own a pair. Comparing these two on the A8 was very easy since it has 2 identical, full-size headphone outputs. Well… listening to these two together it’s clear that they come from the same mould. The presentation is very similar, both are considerably bass heavy, but through this quality of amplification they make a good case for neutrality. Their entire range punches with similar authority, yet it’s controlled under a smooth tonality. The Denon is great here, probably the best I’ve ever heard them, but the TH900 is… I’m sorry for my wallet’s sake… just much better. 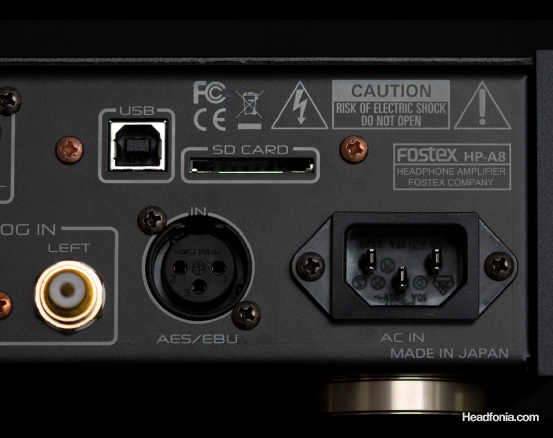 A lot of the magic in the Fostex’s sound happens in the built-in headphone amplifier. The moment I take the signal out, through a pair of interconnects to a separate headphone amp, a lot of that effortless resolution gets filtered. This is why amp builders try to keep the length of a signal path to a minimum. Obviously, no interconnect is as short as a trace in the PCB. This is why most of my listening with the Fostex is done through the built-in headphone amplifier. The good news is that the A8 has an onboard headphone amplifier that’s worthy to be used alongside its DAC. So good was the headphone amp, that I didn’t see the need to pair it to another amp. Usually the problem with onboard headphone amplifiers is that they are limited in power. Not the A8. Max the gain (up to +20.0dB with the latest firmware) and it has enough juice to drive the Hifiman HE-6. Yes. Not as satisfying as the RSA Dark Star or the Burson Soloist but hey, it’s an onboard headphone amp that has more power than a lot of dedicated headphone amps! Throw in a Hifiman HE-500, HE-400 or the Audez’e LCD-2 and the A8 has plenty of headroom left with all of them. With the HE-500, for instance, I’m playing at -25.0dB on the volume control. Plenty of room left with the maximum level at 0.0dB. Both volume and gain level is adjustable via the big knob on the front. It’s not an analog pot behind the knob though; volume is adjustable from -100.0dB to 0.0dB on every gain setting you choose, with 1dB increments. The gain level is adjustable from 0.0dB to a whopping 20.0dB with a 0.5dB increment. That gives you an extremely accurate volume control for both the most sensitive IEM or the Hifiman HE-6. Channel imbalance? None what so ever. Everything is so well made on the A8 and the little interactions make it such a joy to use. Connecting the Fostex TH900 headphones to one of the headphone sockets shows such precision engineering. It’s reminiscent of closing a luxury car door: sublimely smooth but not loose, a perfect fit to the micrometer. The volume dial is similarly flawless and a total joy to interact with. I’m not a fan of stepped attenuators, because it can be hard to find the desired volume and they’re just not as nice to turn as a smooth dial, but not here. This is stepping done right and it retains a wonderful smoothness in operation. You’ll just want to keep touching it. The menu interface is rather fiddly to operate via the tiny dial next to the volume but the browsing of DSD files (which can be sourced from ‘HD-Tracks’ or the ‘Blue Coast Records’) is an even bigger annoyance. Accessing these files can only be done through the included remote control which feels rather cheap, small, awkward to use and is unreliable. The only controls are “play/stop” and “skip track”. There is no “fast forward / rewind” and more crucially, no “folder / album” browsing. I can’t imagine people wanting to use this feature due to the rather poor interface and controls. Even getting the machine to recognize the files will put some people off. There is talk of the A8 supporting DSF play over USB and I for one really hope that this feature is added soon. Until then, if you have DSD files, or want to try them with the A8, my recommendation would be to use the (free) Foobar software on PC. You can then download the SACD plug-in that can down-sample DSF files to PCM on-the-fly (either to 44.1, 88.2 or 176.4khz). The A8 will then take that signal via the USB connection. You can also listen to .DFF files this way too by using a plug-in by Kode54. These are alternative DSD files more common among studio users. 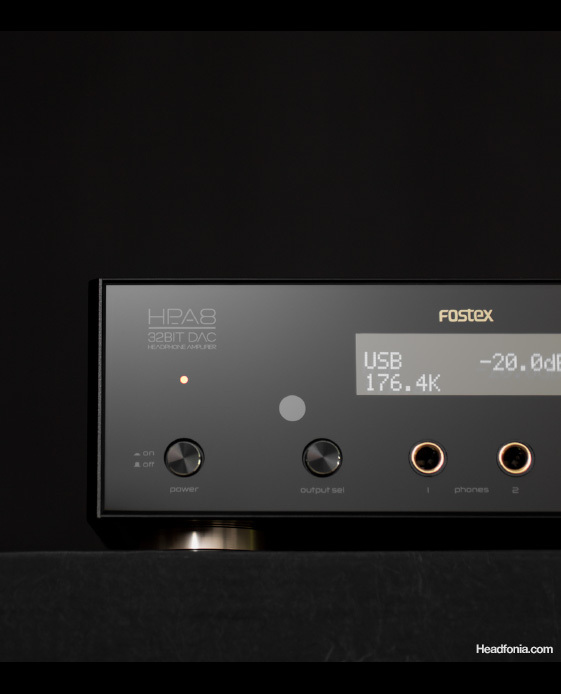 Browsing the technical data and photos for the Fostex HP-A8 might inspire lustfulness, but it’s the sublime sound quality and beautiful build that will really impress. If you’re looking for a great DAC, and a stunningly transparent and smooth headphone amplifier with a ton of inputs and endless clean power, then I highly recommend an audition with the A8. Give it a listen with some nice headphones and I doubt you’ll want to put it down. Unless you just picked it up to see how heavy it is. My current favorit DAC/Amp. As I’ve told Edd, it’s going to be a long road for me to save for the HP-A8c. But I’m sure it will worth the effort. I like it that much! Have either of you gotten a chance to hear the Schiit Gungnir yet? If so, any thoughts or comments on how it would compare to this HPa8? Thanks for the write up, gents! I would love to read that, too! Please Mike! Sorry I’ve not heard that one. Loved the review. I am no envious of anyone who has this. EDD, I laughed out loud at your closing line. It caught me completely off guard. Never underestimate the power of an unexpected pun. I do find that your recommendation to down-sample DSD to PCM a counter-productive move though. One of the USPs of this DAC/AMP is the ability to decode DSD (DSF/DFF/SACD-ISO) files natively (no intermittent PCM conversions) to analogue directly via the DoP protocol. Foobar2000 with the SACD plugin allows you to play DSF, DFF, DST & SACD-ISO files. Furthermore, it even allows you to upsample all 44.1kHz based material (88.2, 176.4, 352.8) to DSD64 or DSD128 on-the-fly. 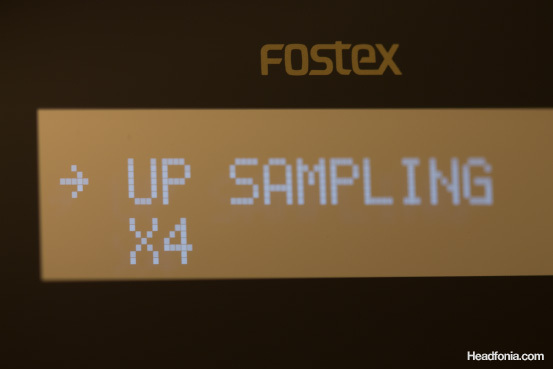 However, the AKM4399 DAC used in the Fostex is hardware limited to DSD64 only. Once you hear native DSD recordings through it’s USB input, you will realise why there is such a big fuss over DSD playback in the audiophile community recently. i.e. closest thing to analogue you can get without all the pops and hisses or the digital edginess/artefacts of PCM. Thanks for the info Ivan, I was hoping the DSD via USB could get resolved and that is indeed a great addition to have. I want it even more now. I imagine it will make Mike happy too since it’s a lot more simple than the SD card. Are you saying that DSD via USB is superior to DSD via SD? … which makes sense as the SD card will have the shortest signal path to commute with the DAC itself and it is not susceptible to computer-generated noise or other external nasties that could have compromised the digital signal. I’ve heard the Invicta – great machine and the SD card is at the front, where it should be. The SD quality makes sense to me although the machine sounds so good anyway! Not to mention that it is such a sublime headphone amplifier as well, something that I can only dream of for my headphone setup. The cost of CAD3,995 isn’t really a walk in the park for us commoners though. Oh yeah it’s insanely good! Here it costs £3500 which works out to over CAD5500, even less of a walk in the park! But yeah if I won the lottery I wouldn’t think twice about getting it! Currently I’m pairing HD650 with A8, it works fine. One thing I feel very confusing is that the bass sounds significantly better (more impact, better quality) from Momentum than that from HD650 on A8, though the latter is known as bass heavier. So, maybe it’s an indication of that the internal amp doesn’t drive HD650 in a great way. I’m not saying the sound is not loud enough, with default amp gain (0) and volume at -30dB, it’s already loud enough. Alright, yes something is up there. But I’m betting the overall sound is better on the HD650 than on the Momentum. I used the HD800 a lot with this, mainly to tap into all that resolution. It doesn’t quite give you the musicality or lushness of a big tube amp, but it excels in different ways. As I’ve mentioned I loved listening to the color of the recordings with the HP-A8, something that a typical DAC + tube amp combo doesn’t quite reveal to that degree. I also like the simplicity of the set-up. Takes much less space than a typical high end DAC + tube amp set up. Great reviews! Can’t wait to audition one for myself. Quick question for the amp section, is it an upgrade from GrahamSlee UL? Or its about the same? Well amp section power wise it seems to be more powerful than the Graham Slee based on my experience with the HE-6. so you prefer fostex than eximus? Mike Please We need an answer to this question! Sorry for missing this question. Yes for sure. The Eximus, I wasn’t really hearing anything special out of it. I wasn’t that blown away with the TH900.. The A8 is revolutionary but I think the TH900 is just a good closed headphone. I am stuck between Violectric V800 and this amp. I am more interested in the DAC performance part. Although V800 is clearly more future proof for its range of outputs. Hi Mike, enjoyed your review. I had the Fostex dac amp for a month trial and listened to it with the HD800s. I would agree with most of your well written review. The depth of the soundstage and transparency is very remarkable. The deal breaker is that the dynamics are noticeably reduced. I compared it to my ageing Benchmark dac pre with both CDP and PC sources and also output it thru my monoblocks and Focal 1027be speakers. I have just received the Eximus for trial but comparisons can only be made from memory. Will report back, first impressions are that it is a very musical dac (a bit of a BS term I know). Thanks for the impressions, James. You were using the Fostex with speakers? Any headphones you use? Yes, I find it useful and sometimes more revealing to listen via spkrs (my room is treated but there’s some boundary reinforcement)- stuff like soundstage and imaging is easier to assess for me. But i was mainly listening via the hd800s as I was assessing it for my headphone setup –think u may have missed that bit 🙂 Also it lacks an XLR out which is better sounding for my monoblocks. It’s been my fourth or fifth times reading your review. And I still remember my goosebumps experience with this dac/amp. Awesome review mike. Fostex’s stuff is pretty awesome. I am going to get this by next week. Do you think it pairs well with the beyer T1 and senn HD650? Just got it and download 2.03b…but how to convert PCM to DSD? hey mike, what is the gain setting that you used on this amp? How does the Hifiman orthos or LCD2 pair with this Fostex? Pretty good but I think the Dynamic driver flagships pair better. What were you referring to, sound quality or output power? I’m considering HE-500 + Solist, but this unit looks very appealing, sound quality would be first driving factor for choice. Well the amplifier quality is not as good as the Burson or the RSA. Weaker dynamics, bass impact, smaller soundstage among others. Thanks, amazingly quick reply. I’ll go with Soloist as I don’t need the DAC, it would be a nice to have, but sound quality should come first every time. I think you’re mistaken. The DAC is what feeds the signal to the amplifier which the amplifier then amplifies to the right voltage level for the headphone drivers to be able to produce the right dB level for the ears. If the signal at the start of the chain is of low quality, you’re not getting any good sound quality. Yes, agree but my source is a Pathos Endorphin feeding a TVC attenuator so have the speaker side sorted, just want a good headphone setup too. Haven’t heard that Burson yet but it looks like a good minimalist – just do the job well – solution. It’s a nice amp if you like warm sound with weighty lows. Thanks Mike, your description sounds absolutely perfect for me. It’s people like you that made the Internet great. I’m impressed by this review also because HP-A8 is currently less than 1000 dollars which is very attracting to me. However, the sales contact told me that it’s only usable with 100V JP voltage rather than 220V (in China), is this true? Yes, but Fostex has a HP8C which is rated for 220V. What is the different between this two? I see the price different so much. I’ve listened to the Japanese version in Japan and I don’t think that the sound is that different from the A8 International version. I didn’t have the International version there so I can’t do an A-B but it sounds pretty similar. Price difference may just be because of Japanese/International market. I don’t know why the price difference is so much. Mike, a somewhat common question: do you use some AC power conditioner/filter during daily listening or review? I heard that some devices are sensitive to external AC power condition even the power cord can improve the sound (the later sounds crazy to me), however it’s difficult to find a comparable review & actual effect about the conditioner devices. I have very little experience with AC power conditioner/filters. In fact I don’t think I’ve ever used them. I don’t know if they make real difference and if there are any, how big is the difference. Rather I just haven’t had the experience. Cool, then I can assume we can hear good enough sound even without them. Thanks a lot! If you use USB computer as music source, a good power conditioner/filter is the iUSB by iFi which is quite affordable. iFi is British. Audiophiles (components) spent thousands of dollars to clean up dirty power supplies. The vast number of power conditioners in the market may give a hint that these really works to remove grunts from the power supply. The market is a reliable gauge. It punishes and eliminates the irrelevant and useless products. So the fact that power conditioners have been with us for over 3 decades indicates that these works. Power conditioners cleans up polluted A/C supplies in homes and feed purer supplies to amps, dac, players etc to give darker background in the music. Base noises removed. A clarity in the music emerged. Authors/writers & readers of high lamas of renowned hifi magazines such as Stereophile or the Absolute Sound subscribe to the essential role of power conditioners. Power cords are all heavily shielded, of special metals/ dialectic and this together with conditioners work. Majority of audiophiles can hear a significant difference. Of course there are detractors. But they never heard these in real life. Yes the truth is it is very easy to criticise. USB cables also make a difference to the sound. How come digital works after all these signals are transmitted digitally ? Use a pair of AudioQuest USB Diamond & connect this to the dac and nay sayers will be shocked and become converts. In the end, the real test is eating the puddings (or durians ) and savour the exquisite taste. Yes and the funny thing is even though I can’t explain why, power cables make a bigger difference on home set ups than speaker or interconnects. That may seem odd, but it's cleverly predictive and results in a wonderful control that makes it effortless to find the correct level. I don’t think you can fix it to a certain dB level as it would depend on the headphone you use. Most stepped attenuators adjust volume in a linear, consistent fashion. This means that each step on the attenuator will increase/decrease the volume by the same amount, whether your listening loudly or softly. However, the HP-a8c’s volume does not work in quite the same way. 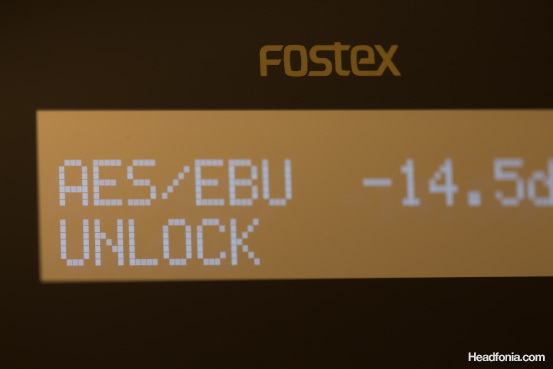 The Fostex’s volume steps change depending on where you are in the volume range. When you are listening very softly – one step changes the volume in coarse grained increments (E.G., approximately 5db). When you are listening very loudly – one step changes the volume in very small, precise increments (E.G., approximately 0.5db). Have you ever heard of a “cost of living multiplier”? Similar concept. Alright, yes I misunderstood your post. Thanks for explaining. What I found is somewhat different with yours, i.e. when < -45dB, the step is 0.5dB change, while my firmware version 2.13B. Interesting. I’m on 1.20, but I’ll updgrade to the 1.31 version and see if things have changed. My thoughts are that they’ve adjusted the sliding scale over firmware versions. My fault, the step is 1.5dB instead of 0.5 dB when < -45dB. The others are the same with your observation. Just want to try it, don’t expect any listening difference actually. Resolved by using SACD Extract under OS X.
I haven’t even tried ripping SACDs. I really don’t think I can discriminate DSD & 24/96, but the DSF I tried is really amazing on details (I guess it’s intended) and worth some trying. Yeah, I’ve listened to a few DSD and I thought that the advantage is mostly in the recording. Not only that I think the 16/44.1 format is good for 99.999% of the stuff out there. The bottleneck is still in the recording process. Will it play WAV’s from SD card? Is 32GB the max SD card size? Will it play up to 96/24 from SD? 2. I haven’t tried the max size, to be honest. 3. I have to double check that one as well. Besides HP-A4, looks like Fostex is also going to publish an audioplayer including dsf/dff, wav, flac, mp3 support on 11/28. Still traveling in Japan but can’t wait to try it after going back to home. A4 is already seen on Amazon japan, though Mike mentioned it’s inferior than A8 on sound quality, to me it’s very attractive, for its much smaller size, USB powered (no voltage problem), also with microSD support which is extremely useful without opening laptop. do we miss a review of this cream of the crop portable dac ? Has anyboday tried using iPad + Camera Kit to stream music over USB port? I heard some DAC (e.g. DACmini) supports it but some others not. Thank you for this test that makes you want! I like the Shure SE846 with assossier. The headphone amplifier is it sensitive enough to not produce breath? i would like to associate with Shure SE846.. The headphone amplifier is it sensitive enough to not produce breath? Would it be a good idea to connect an AK120 to an HP-A8 and use it to power a TH900? Great idea. If you do, see if you can go optical out from the 120 to the A8 optical input, then also from the 120 Line Out (analog out) to the A8’s analog/line input, to compare each method. That way you could maybe tell which has the better DAC. Are these the sort of cords I’ll need? As you can tell I’m very new to this amazing audiophile world. I’ve never used optical cords, but I do know that most DACs will offer resolution above 96k on optical, while most are limited to 96k and below on USB. Analog is much easier to figure out – just make sure the cables have the right plugs on the ends. BTW, don’t go cheap on analog cables – get good ones, and keep them as short as possible. 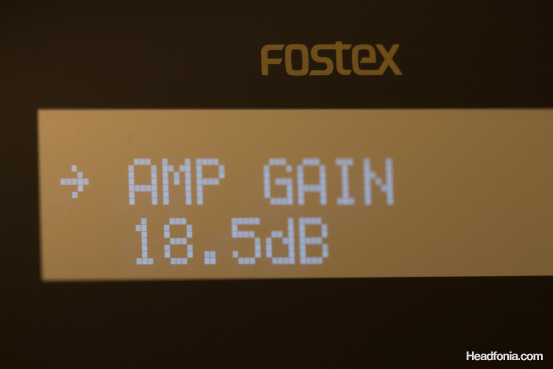 I am waiting on my HP-A8C to arrive with that said what Gain Setting do I use to match it to my Fostex TH900? Max amp output is 700 mw at 32 ohms, and max headphone input is 1800 mw. Seems pretty safe. If the headphone impedance curve were to drop far below 25 ohms at any frequency, that could be a problem. What DAC would you prefer more Eximus DP-1 or Fostex HP-A8? Could you please advise me some reference DAC (in your opinion) in budget upto 3000 USD. Hi, i really enjoy your review. Excellent one! Could you help me with one problem? I am looking for a source to pair with my Cary HH-1 and Grado PS1000 to listen to jazz, classical and vocal like Frank Sinatra and Diana Krall. IS this a good DAC to go for? Thanks in advance. A lot of new DACs have been released since 2012 – what attracts you to this one? I don’t know what to recommend because of the many options. Lieven or Nathan may have a good match in mind. I assume you want a DAC that does not include a headphone amp? Your amp is a hybrid, so would your DAC contain tubes? Do you need optical inputs, DSD processing, etc.? Did the Cary people have any suggestions? Yeah you spoke for my mind. I just need a standalone DAC, i dont need it to have pre amp too. I play quite a lot of DSF files and i dont need optical input. I just need rca (better if it has balance out). The DAC i think can be solid state, dont have to contain tubes. I have not asked Cary. I prefer Headfonia more. Oh and my budget for a DAC unit is $1000 or less (i dont’ mind if i have to buy a used one) Thanks in advance.